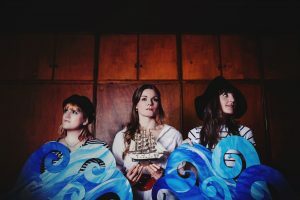 Said The Maiden are Jess Distill, Hannah Elizabeth and Kathy Pilkinton, three friends who discovered a mutual love of folk music when they reunited several years after spending their school years together in St. Albans, Hertfordshire. The group sing traditional songs from around the UK and America, often in three part acapella harmony but also using guitar, violin, mandolin, woodwind, accordion and percussion to embellish their sound. From tentatively performing a few songs at their local Redbourn Folk club in 2012 and later being asked to appear at one of the club’s guest nights, the group soon secured support and headline slots at folk clubs and festivals around the country, including Folk By The Oak, Folkeast, Gate to Southwell, Shepley and Bunkfest. These opportunities have in turn led to invitations to support many fantastic artists including The Fisherman’s Friends, Jim Moray, Megson, Martin Carthy, Sam Carter, Hannah James and Sam Sweeney, Treacherous Orchestra and Clannad. They were also honoured to join legendary fiddler Dave Swarbrick on a successful UK solo tour in the spring of 2014, and released their debut album ‘A Curious Tale’ in June of the same year. In May 2015 Said The Maiden was awarded Bristol Folk Festival’s prestigious Isambard Folk Award, and as a result opened for folk super-group The Full English at the 2015 Bristol Folk Festival. Most recently the group was voted for by festival-goers at the Great British Folk Festival 2015 as ‘best act’ on the Introducing Stage on the opening night, and performed on one of the festival’s main stages in December 2016.